A group of Iranian students has begun a petition against gender segregation at their university. The International Campaign for Human Rights in Iran reports that hundreds of students at Payam-e Noor University in Kurdistan have begun petitioning against gender segregation in several of their courses. 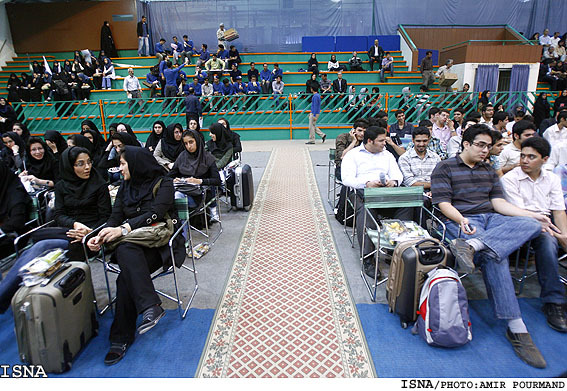 Since the beginning of the 2012 academic year, several university courses are being offered in gender-segregated classes, and the students have challenged the move by collecting signatures on a protest petition as well as by organizing a group of women to participate in the male-only classes and vice versa. Meanwhile, reports from Shiraz University indicate that students demonstrated on Saturday against the new practice of having male-only and female-only entrances. Campus buses have also been segregated. Iranian authorities have been implementing strict changes at universities in addition to the growing gender segregation in classes and in public spaces on campus, including the installation of surveillance cameras to monitor student behaviour.